This course is geared towards Ashtanga beginners who want to gain an understanding of Ashtanga Yoga and wish to begin practicing in the traditional format called Mysore style. It is also ideal for those who have practiced some Ashtanga but have either fallen out or have yet to establish a daily practice. You will be guided by Elizabeth & William in a relaxed intimate setting allowing for individual attention. Each class will begin with a foundational discussion on yoga, covering the importance of breath, Drishti (gazing point), and the effect of yoga on the body and mind. Classes will consist of discussion, postures, breathing practices, with plenty of time devoted to answering your questions and attending to your individual needs. 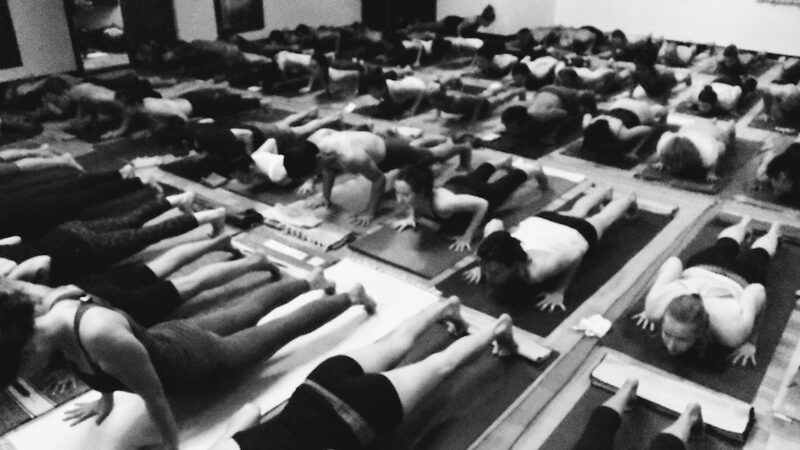 You will build your practice progressively from one week to the next, and by the end of week four, you will have a firm foundation on which to continue your yoga practice. The format is designed to provide the cornerstone to what might very well be for you a lifelong practice. Some of the overall benefits you can expect to experience are: strength, stamina, flexibility, spaciousness, improved breathing and awareness of the breath, clarity of mind, as well as enhanced ability to focus. In addition to Tuesday nights, course tuition includes 1 day per week of Mysore class OR our Saturday “Introduction to Ashtanga” class. More information, please email: elizabeth@ashtangayogadenver.com.